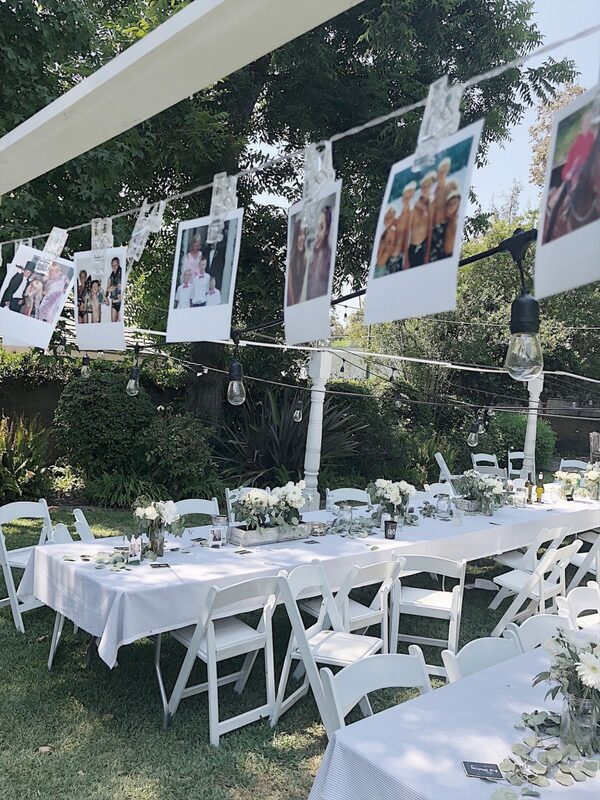 This is part three of my story about creating a magical engagement party. 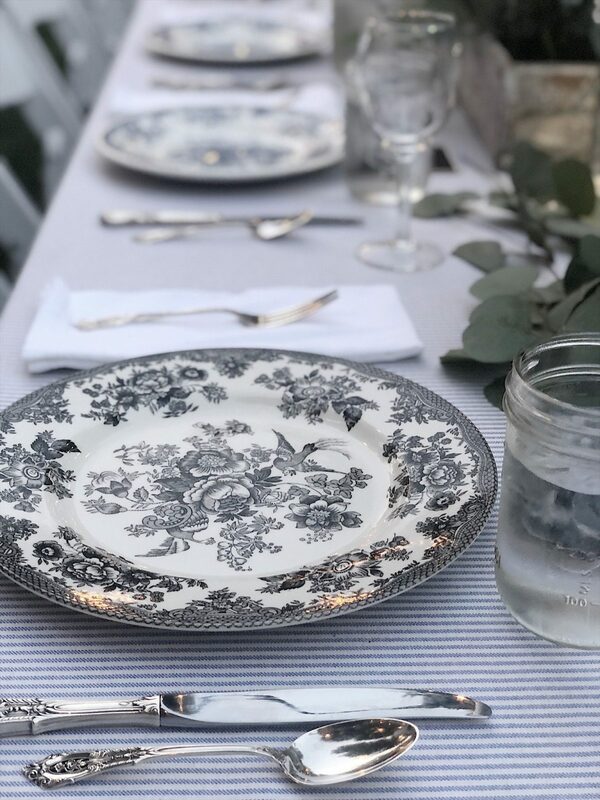 Today I am going to share how I added decor to my outdoor dining room. 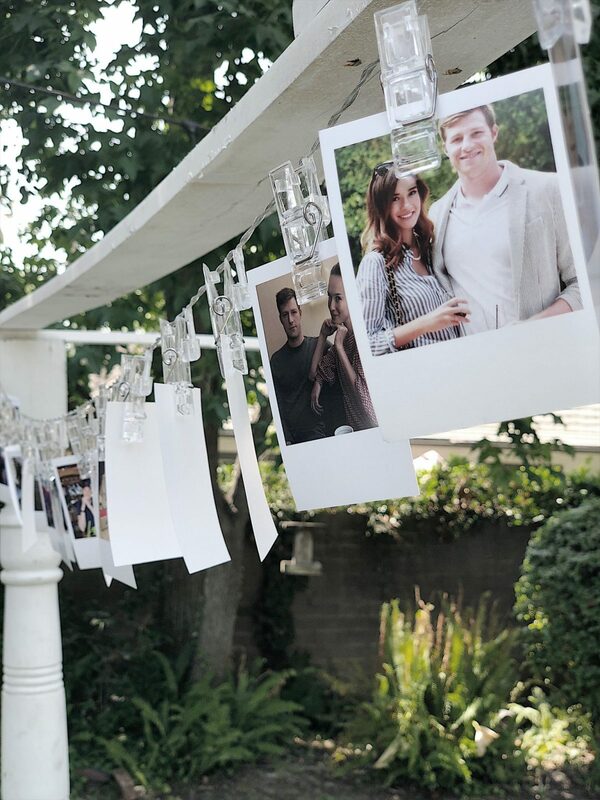 My goal for the engagement party was to create a beautiful California Hamptons environment that was relaxed and fun. In truth, this was probably my favorite part of creating this wonderful party. You can also read my earlier posts. 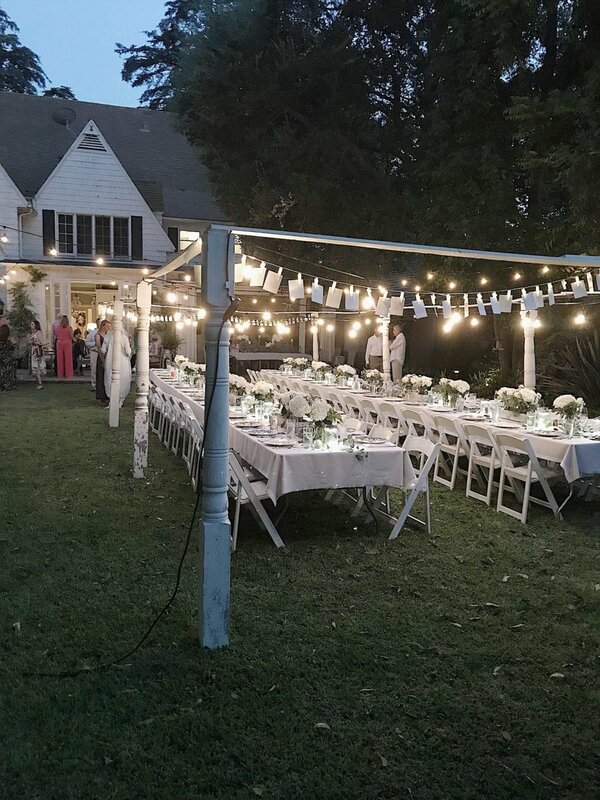 Part one – “How to Plan the Party of Your Dreams“. 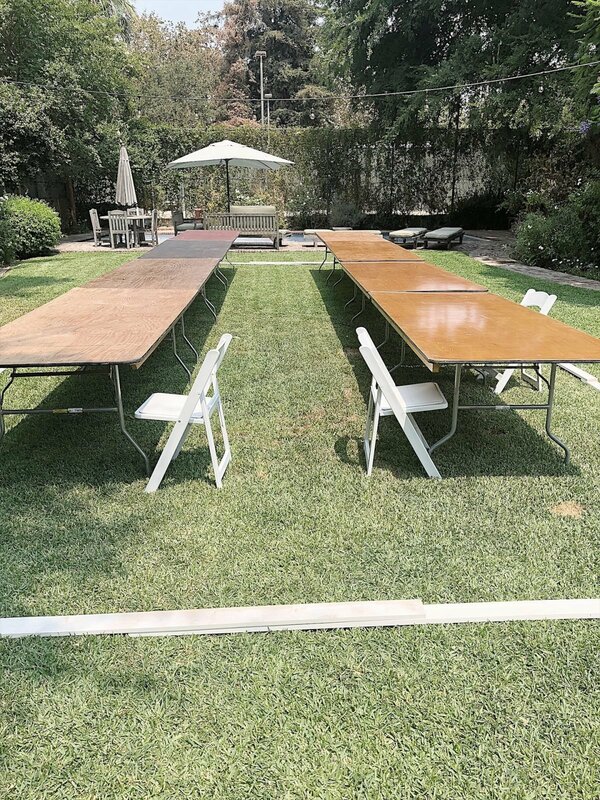 I rented eight tables measuring 8 ft. by 30″. I also rented 68 padded white chairs. Everything else that we needed for the party I already owned, including the buffet tables. 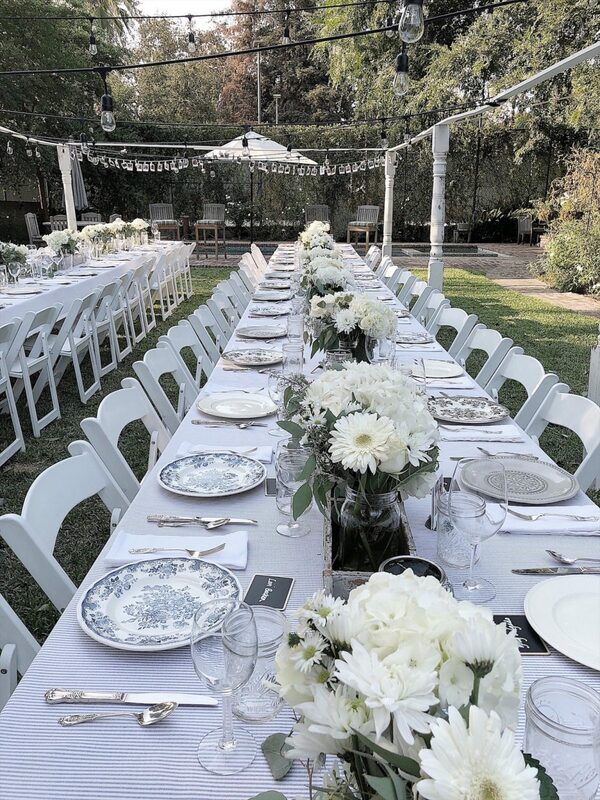 When I rented the tables and chairs, I inquired about renting tablecloths. I am not a big fan of polyester tablecloths and the rental company quoted me $48 each to rent their nicest polyester tablecloths. Since I needed eight, that was out of the question. So I headed down to the fabric mart in Los Angeles, which is located all around the large fabric store, Michael Levine’s. I spent almost two hours looking for tablecloths. In my mind, I had a very specific need which was twenty-seven yards of 60″ wide blue and white striped fabric. You can watch my shopping trip in my story highlights. I considered a lot of options and I am so happy I didn’t settle because at the last store I found exactly what I wanted. And it fit my budget of less than $7 per yard. The good news is that I can reuse the fabric for a slipcover or pillows or whatever! I mentioned I had selected a color scheme of white, gray and blue. I was able to source 65 plates in my butler’s pantry and I love the mixed assortment. 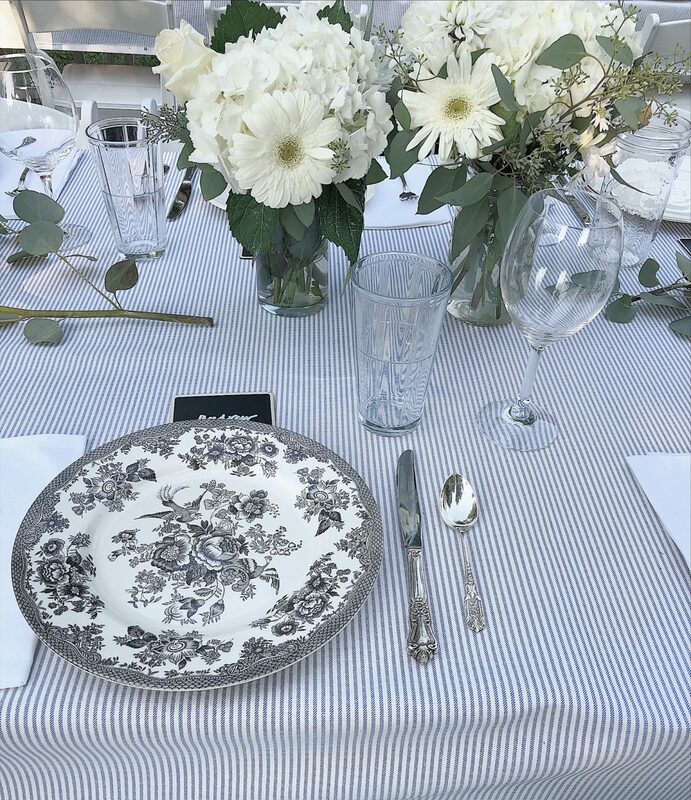 I also had enough silverware, water glasses, wine glasses and white cloth napkins to set both tables. Remember when I organized my napkin drawers in the butler’s pantry? That project made all of this possible! For the centerpieces, I was able to borrow these vintage brick molds from my friend Debra Hall. The fact they are gray and chippy made them better than perfect! I just love them! Over the years I have collected a lot of vases and I used a lot of my vases and some mason jars. I needed 36 vases and a lot of flowers! I sourced my flowers from two different. 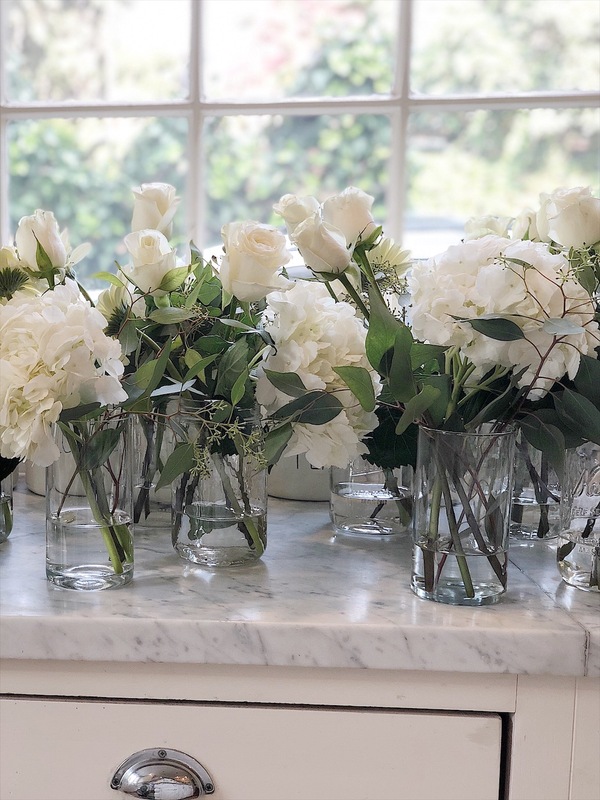 I partnered with Flowers by Gallone&i and they sent me two large boxes of white hydrangeas. Their flowers come straight from South America and are shipped free via two-day Fedex. Each box has thirty hydrangea flowers and they are all just perfect. I also went to the Los Angeles Flower Mart and bought lots of fresh eucalyptus and white flowers to finish off the centerpieces. I was so happy how they came out. The lights that were hung above the tables were the Btightech Ambience Pro LED Waterproof Outdoor String Lights from Amazon. I used two 48′ strands. On the tables, I used my rechargeable solar lanterns by Sonnenglas. I added blue and white sea glass and charged the lids of the mason jars in the sun for twelve hours. They looked fabulous. 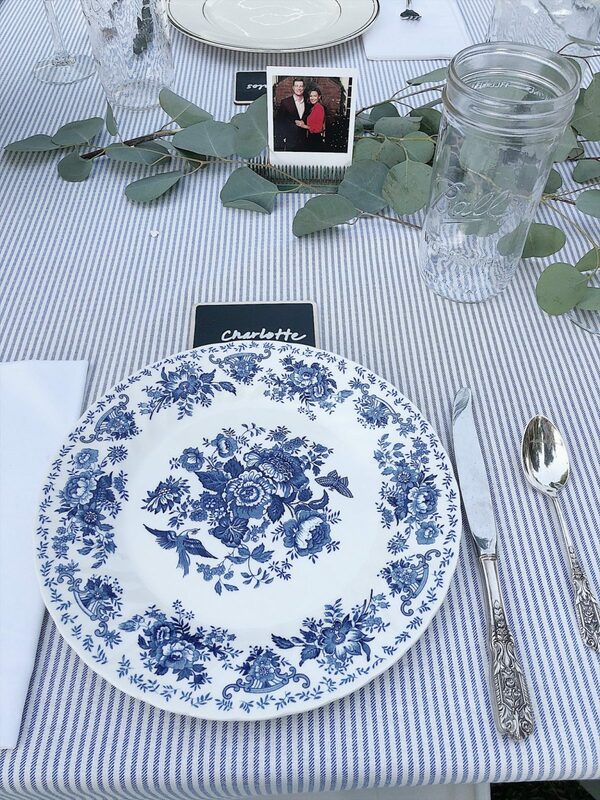 I wanted to share some photos of the bride and groom to be and found a company that would print any photos in a 3″ x 4″ size vintage Polaroid. I used a company called FoxPrint. All we did was upload the photos to their site and they turned my order around in one day. 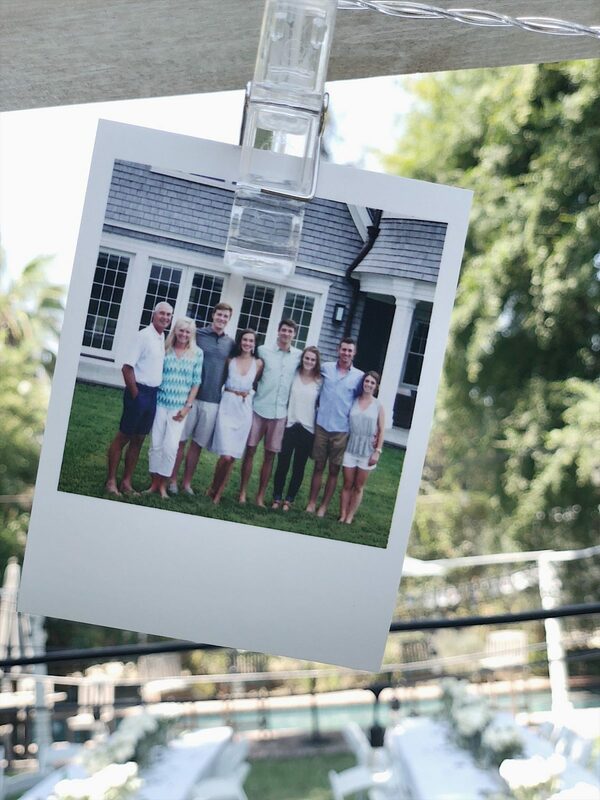 The cost of each photo was thirty-five cents and so worth it! We found photos of the bride and groom to be on their Instagram and Facebook accounts. I hung the photos on dimmable LED Photo Clips and also put them on the tables using my vintage flower frogs. Tomorrow I will finish the decor details and then Friday we will talk about the food and menu! I am interested to know what brick moulds are. I have an idea by studying them on the table but could you please explain. They are the little trays / rectangle boxes that she set the vases in. You can see them on the table. Lovely. You make it look so easy Leslie!